Efficiency in manufacturing is heavily influenced by the use of equipment. If equipment isnâ€™t running at peak performance, then it canâ€™t yield a large enough output to cover the initial investment. 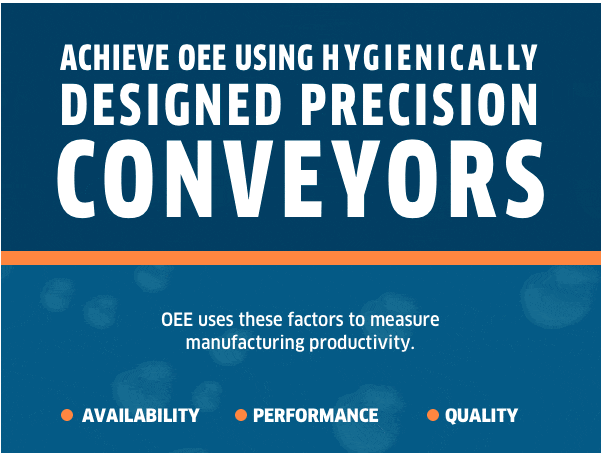 View our latest infographic to learn how hygienically designed conveyors can help you and your company maximize your OEE. 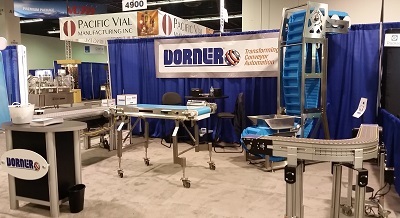 Dorner recently worked with a customer who required a 101â€� wide conveyor. The conveyor needed to accept three side-by-side stacks of light-weight product that were up to 30â€� wide apiece. 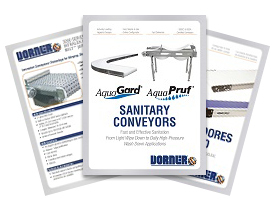 The challenge was, Dornerâ€™s widest standard offering is the 52â€� wide belt on the AquaGard 7360 platform. The application did not require stainless steel construction, so Dornerâ€™s Engineered Solutions Group recommended a unique solution using the 3200 Series platform and overcame two engineering challenges along the way. We have new Dorner literature available to download on the Literature Page. We are exhibiting our new 3200 Series with ARB Technology conveyor, as well as the sanitary AquaPruf 7600 VBT platform, in Booth No. 628 at PACK EXPO East 2017, Feb. 27 â€“ March 1, in the Pennsylvania Convention Center, Philadelphia. Ryan Knudtson, a student at the University of Wisconsin â€“ Stout, is the recipient of the 2016 Richard C. Ryan Packaging Education Scholarship, funded by Dorner Mfg. Corp. This $2,000 scholarship, awarded to a student enrolled in a two- or four-year program at any of PMMIâ€™s partner schools, was established in honor of Richard Ryan, the former president and CEO of Dorner, who passed away suddenly in September 2012. Thank you to everyone who was able to join us in Anaheim, California for WestPack 2017 last week. We had a great show and are already looking forward to next year.